Help make Jo's dreams come true! Join her in a challenging journey to build a coffee shop. Learn to make different brews, take orders and manage staff! Help make Jo's dreams come true in Jo's Dream: Organic Coffee! Join her in a challenging journey to build a coffee shop. Learn to make different brews, take orders and manage staff. Make customers happy by serving them fast with the correct order. 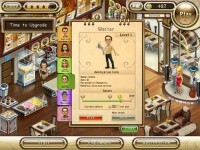 Improve their mood by inviting musicians and attracting celebrities to your shop in this fabulous Time Management game! Help make Jo's coffee shop dreams come true! Tell someone about Jo's Dream: Organic Coffee Game! JKwQ59 You made some respectable points there. I seemed on the web for the difficulty and found most people will go along with with your website. veO7sZ It is best to participate in a contest for among the best blogs on the web. I'll advocate this web site! oCF9XK Heya i'm for the primary time here. I came across this board and I in finding It really useful & it helped me out much. I am hoping to offer something back and aid others like you aided me. itrT8X Say, you got a nice blog post.Much thanks again. Really Cool. mq3Ndz Very good blog article.Really looking forward to read more. Fantastic. e7TUAb Thanks again for the post.Really looking forward to read more. Cool. hBfb3Z Muchos Gracias for your article.Really thank you! Great. YGWlBe A round of applause for your article post.Much thanks again. Much obliged.